"Weird Circle -- Murders In Rue Morgue"
Edgar Allan Poe was known as a writer of poetry, short stories, and criticism, though he was known best for his macabre tales. 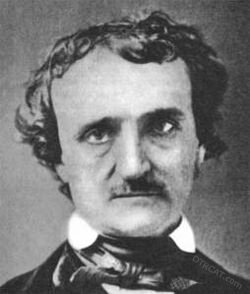 Poe was born in 1809 in Boston, Massachusetts to two Scotch Irish actors. Each died before young Edgar reached the age of three. He was then taken into the home of a tobacco merchant. After attending school and amassing large gambling debts, Edgar had a falling out with his foster father. Unable to pay his debts and penniless, he joined the army, reached the rank of sergeant, and was discharged - all by the age of 20. While in the army, he wrote and published his first book, Tamerlane and Other Poems, which he authored anonymously as being "by a Bostonian. Edgar grieved deeply from his foster mother's death. After another falling out with his foster father, Edgar went to live with his widowed aunt and her daughter, Virginia. At 27, Edgar fell in love with lovely first cousin Virginia, age 13. He began writing fiction to support them. In 1839, at the age of 30, Poe published some of his most popular works in the two volume collection, Tales of the Grotesque and Arabesque. His grief flowed again when young Virginia broke a blood vessel during a particularly intense evening of singing and playing the piano. The girl had contracted tuberculosis, then known as consumption. During Virginia's illness, Edgar continued writing and working as an editor. After Virginia's death, Edgar found new love with the poet, Sarah Helen Whitman. Her mother disapproved and their engagement was broken, possibly due to Edgar's wild drinking and unusual behavior. At the age of 40, Poe suffered an unusual death where he was found on a Baltimore street in someone else's clothing. The papers reported his death as due to a "constricted brain, although there are more recent rumors of him dying from rabies. 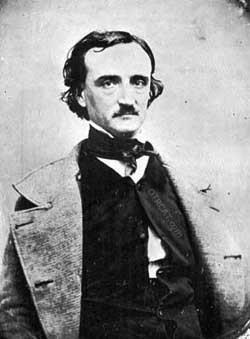 This collection includes some of Poe's most famous writings, such as The Telltale Heart, MS Found in a Bottle, Cask of Amontillado, and The Fall of the House of Usher. These macabre tales appeared on some of the most suspenseful and best horror old time radio shows of all time, including Black Mass, Weird Circle, and Escape. So prepare yourself for bone chills, because Edgar Allan Poe's hair raisers have made it to the radio! See also: HP Lovecraft Collection. I got my disc last year and have enjoyed it thoroughly! I especially like the fact that it covers several of Poe's lesser-known stories. Just in time for the season. Order yours and relive the genuine creepiness of a retro-style radio Halloween. These really are excellent adaptation with some of the biggest stars in Hollywood. HIGHLY RECOMMENDED!